This data set contains moisture content measurements for fuel sticks located in the forest understory of the rainfall exclusion experimental site, Tapajos National Forest, Para, Brazil. The mean and standard errors are reported for control and treatment plot measurements. The measurements were taken on various dates and times of day between 1998 and 2000 during the dry season. The rainfall exclusion treatment began in late January 2000 and continued through December 2004. About 60% of throughfall (equivalent to approximately half the rainfall) was diverted from a 1-hectare plot (i.e., dry) using plastic panels installed in the understory. The comparable 1-hectare control plot (i.e., wet) was unaltered. The goal of this experiment was to observe the potential effects of severe water stress on a humid Amazonian forest (Nepstad et al., 2002). There is one comma-separated (.csv) data file with this data set. Figure 1. Idealized model structure for water cycling in a deep Oxisol. Drawn by Kemel Bittencourt Kalif. From Belk et al. 2007. This data set was archived in July 2014. Users who download the data between July 2014 and July 2019 must comply with the LBA Data and Publication Policy. The investigators were Nepstad, Daniel Curtis; Miranda, Heloisa S.; Andrade, Sergio Viana de; Arce, Javier Alberto; Asner, Gregory Paul; Bamberger, Barbara; Belk, Elizabeth Leslie; Bishop, Joshua Thomas; Breyer, Lace Medeiros; Cardinot, Gina Knust; Carvalho, Oswaldo de; Chermont, Larissa Steiner; Dias-Filho, Moacyr Bernardino; Diaz, Maria del Carmen Vera; Figueiredo, Ricardo de Oliveira; Guerrero, Jose Benito; Holbrook, Noel Michele; Kingerlee, Wendy; Klink, Carlos Augusto; Lefebvre, Paul A.; Maklouf, Eduardo Jorge; Markewitz, Daniel; Merry, Frank David; Miranda, Antonio C.; Monacao, Luciana; Morton, Douglas Christopher; Moutinho, Paulo Roberto de Souza; Oliveira, Rafael Silva; Peters, Charles Merideth; Pinto, Flavia dos Santos ; Quesada, Carlos Alberto Nobre; Ray, David Graham; Rivero, Sergio; Santos, Alexandre J. B. ; Schwalbe, Karen R.; Silva, Dulce Alves da; Solorzano Cardenas, Luis Anibal and da Silva, Wanderley Rocha. You may contact Nepstad, Daniel C. (dnepstad@whrc.org); Moutinho, Paulo Roberto de Souza (moutinho@amazon.com.br); Ray, David G. (dray@whrc.org) and Lefebvre, Paul A. ( paul@whrc.org ). 3 TOD_class Time of day class: Time of day when sticks were weighed in the field. Time period: 1998/10/09 to 2000/11/17. These data can be used to predict forest flammability to fire, which is, in part, explained by variations in fuel moisture. This is a short period of measurements. The major treatment-induced changes in the experiment were observed after these measurements were taken. The research was located in the Tapajos National Forest, in east-central Amazonia. This forest receives between 600 and 3,000 mm of rain each year, with a mean of 2,000 mm; severe drought during is experienced during El Nino events. The forest is situated on a flat terrace of Tertiary sediments capped by the Belterra Clay Formation (Clapperton, 1993), and is approximately 90 m above the water level of the Tapajos River, located 10 km to the west. The Oxisol soil (Haplustox) is dominated by kaolinite clay minerals and is free of hardpan or iron oxide concretions in the upper 12 m.
Drought effects on forest processes were studied by comparing a 1-ha forest plot from which a portion of throughfall was excluded with a nearby 1-ha control plot. Two floristically and structurally similar, 1-ha (100 by 100-m) plots were selected for the experiment from an initial survey of 20 ha of forest (Nepstad et al., 2002). The forest surrounding the plots had emergent trees up to 55 m in height, with continuous canopy varying in height from 18 to 40 m. The study plots were placed in areas where most of the canopy was less than 30-m high to facilitate access to the tree crowns. A one to 1.7-m deep trench was excavated around the treatment plot to reduce the potential for lateral movement of soil water from the surrounding forest into the plot, and to provide a conduit for water excluded from the plot. A similar trench was excavated around the control plot to avoid the confounding of throughfall exclusion and trenching effects. Following an intercalibration period of approximately one year starting in November of 1998, throughfall was partially excluded during the rainy seasons of 2000 through 2006 using plastic panels and wooden gutters installed in the understory. Throughfall exclusion panels, Tapajos National Forest. The throughfall exclusion panels drain into wooden gutters constructed in the forest understory. Photos from Nepstad et al., 2002. The fuel sticks were pine dowels manufactured to a forest science standard. They were 18 inches long and 1/2 inch in diameter, and laid out in groups of six, each separated from its neighbors by a small gap. The sticks were dried and weight measurements were recorded. The sticks were then placed on racks above the forest floor and allowed to absorb moisture as local conditions permit. They were periodically weighed in the field at different times of day between October 1998 and November 2000, as an indication of the moisture levels of the fuel layer on the forest floor. Belk, E. L., D. Markewitz, T.C. Rasmussen, E.J. Maklouf Carvalho, D.C. Nepstad, and E.A. Davidson. 2007. Modeling the effects of throughfall reduction on soil water content in a Brazilian Oxisol under a moist tropical forest. Water Resources Research, Vol. 43, W08432, doi:10.1029/2006WR005493. Clapperton, C., Quaternary Geology of South America, Elsevier Sci., New York, 1993. Nepstad, D.C., P. Moutinho, M.B. Dias, E. Davidson, G. Cardinot, D. Markewitz, R. Figueiredo, N. Vianna, J. Chambers, D. Ray, J.B. Guerreiros, P. Lefebvre, L. Sternberg, M. Moreira, L. Barros, F.Y. Ishida, I. Tohlver, E. Belk, K. Kalif, and K. Schwalbe. 2002. 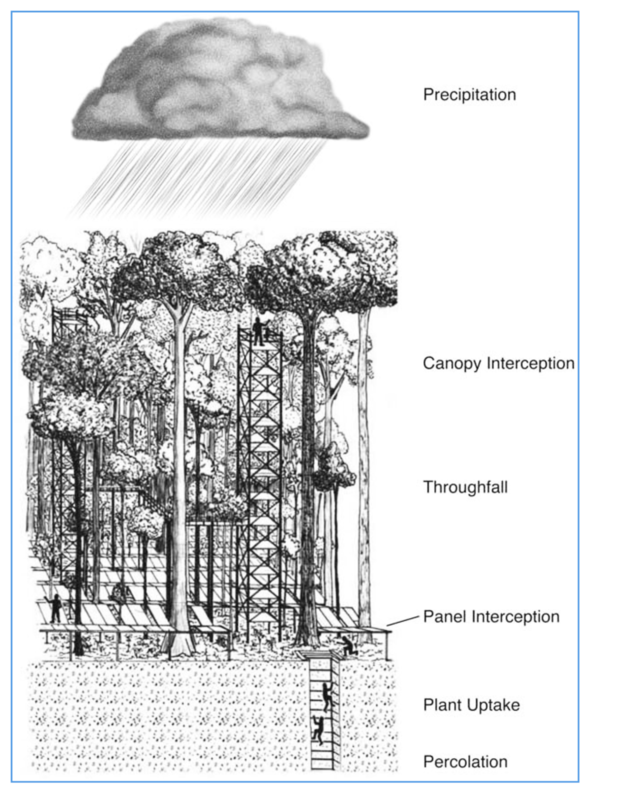 The effects of partial throughfall exclusion on canopy processes, aboveground production, and biogeochemistry of an Amazon forest. Journal of Geophysical Research-Atmospheres 107(D20).